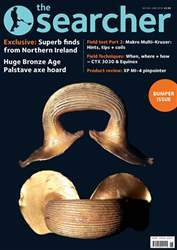 (2 Customer Reviews) | Write Review 12 issues per year A monthly metal detecting magazine which is full of: the latest discoveries, finds Identification and valuations, news and views, collections, detailed finds articles written by experts, field tests and detecting tips, research and club news. What’s new in this issue? Our exclusive cover story this month comes from Northern Ireland. Finder David Murdoch shares how the hobby has grown on him along with his collection of finds! We also have a huge hoard of Bronze Age axeheads from Wiltshire, found by a Dutch detectorist. There is Part 2 of a Field Test on the Makro Multi-Kruzer which includes: Tips, hints and a look at optional coils. Sid Perry also looks at When, where and how to use the CTX 3030 & the Equinox 800 and Gary Cook looks at the new XP MI-4 pinpointer. We have much more in this BUMPER issue for you to read too! You'll receive 12 issues during a 1 year The Searcher magazine subscription. I have been reading this magazine since the 80's and it is still the best for articles and news. I particularly like I.D. and valuation desk along with the club reviews because they widen my knowledge of the artefacts out there in the fields of our historic country. Downloaded OK. A little sluggish when sliding pages to read. You'll receive 12 issues during a 1 year The Searcher magazine print subscription.